One doesn’t really need to look for inspirations. Inspiration is everywhere, from a causal conversation, a sightseeing, a gathering, and, yes, splendid pictures. After all, a picture is worth a thousand words. The key is being grateful, being wanted to be inspired. Gratification allows one to abandon the arrogance that blocks seeing things that are inspiring, things that are heartwarming, things that make life meaningful, colorful, and fulfilling. I have been fascinated daily by the creative arts shared on Facebook by friends, whether it’s a beautiful photograph capturing the elegance of nature, or a stunning painting revealing an enlivening message. Looking at them defines a still moment of joy, rejuvenates the otherwise fading sense of humanity. I thought the least I can do is treasure it for more people to enjoy. The Global We ~ You, Me, Us… ALL of us are changing the world! Rucar: through the Wheelchairs For Iraqi Kids Project by Brad Blauser, I met two friends, Lili Avram and Cornelia Davis. They both share the passion to make their hometown a better place for the people there: better development, better education. I admit that I did not know much about Rucar before. Seeing the breathtaking pictures they and their friends posted, I just know I want to visit that gorgeous place soon, meet the friendly people and enjoy the local cuisine. Autumn: Rachy is a “musician and artist at heart”. But she’s definitely a photographer. Her album Fall 2009 captures some of the most stunning colors nature offers. This collection was taken around Boston. It reminds me a famous poem by the celebrated writer Du Mu of the Tang Dynasty: The frost-covered leaves are redder than the spring flowers. 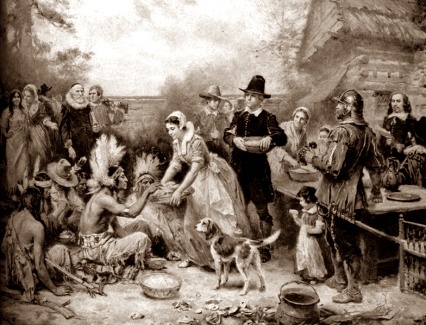 My first Thanksgiving dinner was also my first dinner with an American family. I was quite adventurous when it came to food. In the very first few months in Madison, I had already tried burger, pizza, taco, french fries, spaghetti, you name it. But, turkey, stuffing, cranberry sauce, pumpkin pie? Those were all eye opening (and mouth watering) . I got to admit that I immediately fell in love with the Thanksgiving feast. Being the first real interaction with a local family, I was eager to make a decent conversation with them in my broken English. It was a nice family. A middle aged couple with 2 lovely kids, Jake and Kelly, 7 and 9, respectively. They were curious about me as much as I was about them. The couple were both working for the state at the time. They had a farm north of Madison (I did visit their farm later). They told me where and how the Thanksgiving tradition came from, and said, among another things, they were very grateful. I stopped them there and asked the meaning of the word grateful. It took some struggling for them to explain. It finally registered. I quickly searched my Chinese vocabulary bank to try to find an equivalent, but realized there was not an expression in my native language that would precisely describe it. The dinner was fabulous, the experience was invaluable. And more than anything else, I learned a new expression: be grateful! You see, being grateful is not just a simple reaction to some occurrence. Being grateful is an attitude towards life. It can be just the missing link between tribulation and happiness, between agony and peace, between anxiety and content. Defends – Just 15 minutes a day focusing on the things you’re grateful for will significantly increase your body’s natural antibodies. Sharpens – Naturally grateful people are more focused mentally and measurably less vulnerable to clinical depression. Calms – A grateful state of mind induces a physiological state called resonance that’s associated with healthier blood pressure and heart rate. Strengthens – Caring for others is draining. But grateful caregivers are healthier and more capable than less grateful ones. Heals – Recipients of donated organs who have the most grateful attitudes heal faster. On this thankful Thanksgiving holiday, we ought to be grateful for the fact that we are born to this world, the fact that we are living in this land of freedom and opportunity, the fact that each of us is uniquely created with a sense of purpose – the Gift Of Diversity.